Sennheiser announces the rebirth of two of true Legends. 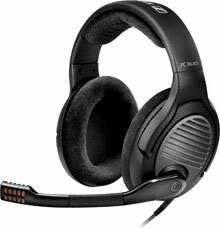 The sought after PC 350 and PC 360 gaming headsets have been reengineered to feature optimized comfort, design and virtual 7.1 surround sound, and will be officially launched at CES, the World’s Largest Consumer Electronics Show in January 2012. A professional noise blocking headset, the PC 350 Special Edition will keep you gaming in private. Even at full volume, more than 95% of the gaming audio will remain inside the headset so you can immerse yourself in the game while those around you, won’t hear a thing. This is optimal for professional gamers at LAN events or home players who don’t want to be interrupted, - or interrupt others while playing. The Special Edition also features the most accurate sound reproduction in a gaming headset today. Utilizing Sennheiser’s “Eargonomic Acoustic Refinement” technology, the headset channels audio signals directly into your ears, rather than onto them. Delivering full virtual 7.1 Surround Sound with Dolby® Pro Logic® IIx, the PC 363D Surround Sound creates a much deeper audio experience and allows you to accurately pinpoint the direction of engine roars, shots or explosions. Designed for long hours of gaming, without breaking a sweat or getting warm ears, it features an open acoustic design, which lets air flow through to keep you extra comfortable at all times. Both headsets feature German-engineered technology with speakers manufactured individually at Sennheiser’s own facility in Ireland. They come fully equipped with a pro noise cancelling microphone, and – to top it off, Sennheiser has built all headset controls into the specially designed metal ear cups and microphone boom, making volume control and mute functions easy and intuitive. “We realized that the previous models, from 2008 and 2010 are still the most sought after headsets by gamers. We have learned a lot since developing them, so we went back to see how we could make them even better, using what we know today,” says Product Manager Christian Ern of Sennheiser Communications. The PC 350 Special Edition and PC 363D Surround Sound are available on Amazon online stores today and will be available in general retail from January 2013 at recommended retail prices of €199 and €249 respectively. Just like the rest of Sennheiser’s products, both headsets are built to last and therefore come with Sennheiser’s two-year worldwide warranty.